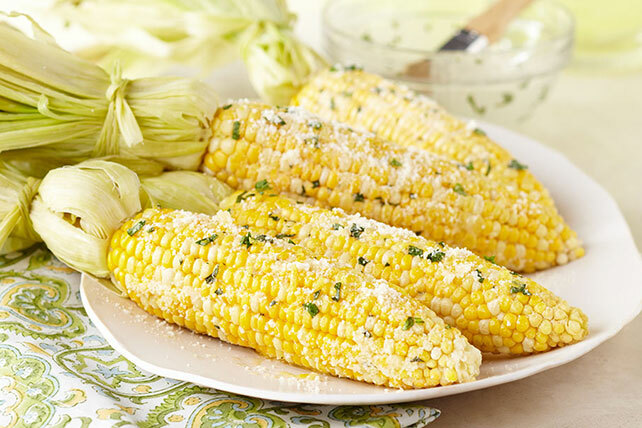 Your hot corn on the cob will most definitely win in the best-dressed category if you brush it with this lemon-basil butter and some grated Parmesan. Brush corn with combined butter, basil and zest. This corn on the cob has built-in portion control, so you can enjoy your favorite foods on occasion while easily keeping tabs on portions. Fresh sweet corn is at its peak in August. There are three types of fresh corn generally available: yellow, white and bicolor. Yellow corn has large, full-flavored kernels and white corn has small, sweeter-flavored kernels. Bicolor corn has both yellow and white kernels. Select ears of corn with soft, bright green husks that fit tightly against the kernels. The silk should be golden and moist like grass. Avoid tearing back the husk to inspect the corn as this causes the kernels to lose moisture and freshness. Heat grill to medium-high heat. Pull back husks of corn, leaving husks attached at bottom of each ear; discard silk. Return husks to original position; then soak in water 10 min. Grill 15 min. or until corn is tender, turning occasionally.